Geneva Rock has applied for a zoning change to a portion of its property in Draper City for mining, and offered to set aside another portion of its property to create the Steep Mountain Conservation Area, which would preserve all of Steep Mountain. 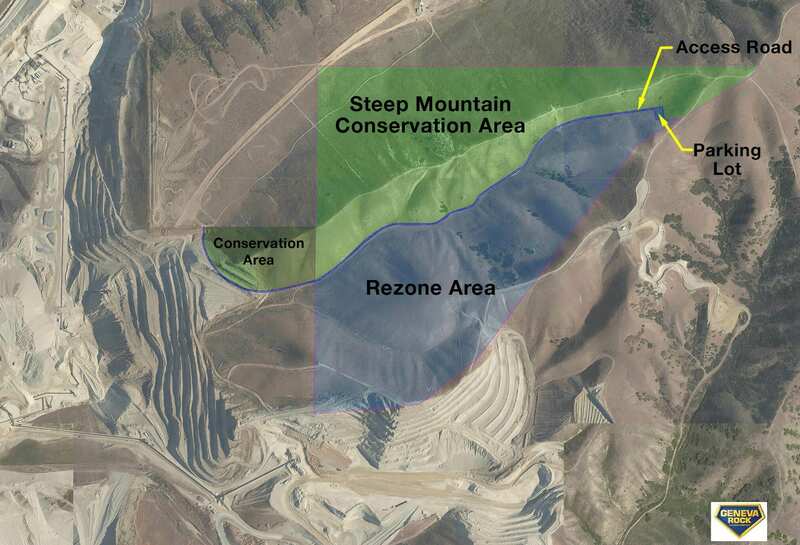 Details about the Steep Mountain Conservation Area and the zone change are below. Questions and comments regarding this application can also be submitted below. Geneva Rock’s property is a unique resource of necessary building materials that will be used in the construction of homes, roads, schools, churches, parks, business centers and more in Draper and surrounding communities. 72.9 acres of property owned by Geneva Rock to be rezoned from A5 to M2. Upon adoption of the zone change by Draper City, Geneva Rock will begin working with the city to establish the new Steep Mountain Conservation Area and recreation access road. Mining will begin upon adoption of the zone change and continue until complete. The rezoned area will be bordered by already existing mining and excavation areas and the Steep Mountain Conservation Area. This map shows the property that is part of Geneva Rock’s application. The area in blue will be rezoned from A5 to M2. The lighter green area is currently zoned A5 and that zoning will not change, but will become the Steep Mountain Conservation Area. The darker green area is legal nonconforming, or “grandfathered,” and is currently available for mining, but will be included in the Steep Mountain Conservation Area and will not be mined. Within the grandfathered area, the small portion of land that was previously excavated will be smoothed over and reseeded. The blue line represents the future dirt road and parking area that will provide recreation access to the conservation area. When did mining operations begin at Point of the Mountain? When did Geneva Rock begin operating at Point of the Mountain? What will happen to Steep Mountain? How many acres is the Steep Mountain Conservation Area? How many acres is the rezone area? How long will it take Geneva Rock to complete mining in the rezone area? How does Geneva respond to concerns about silica? Silica is one of the most abundant compounds on earth and is commonly found in minerals such as quartz. In Utah, where our mountains, rocks, and dirt contain quartz, we are all exposed to silica. Exposure can happen at a gravel pit, baseball diamond, playground, hiking in the mountains, or out in the desert. Workplace exposure is often the greatest concern related to silica, therefore, MSHA & OSHA monitor workers’ exposure and mining practices to ensure that gravel pit operators are implementing measures to reduce dust. Geneva Rock complies with these requirements. Geneva Rock has not had any reported cases of workplace-related silicosis. How does Geneva Rock reduce dust? How does Geneva Rock reduce pollution? Geneva Rock is connecting the communities that you live in. Everyday, hundreds of thousands of Utahns use roads to get where they need to go. At Geneva Rock, we’re committed to building those roads with quality, safety, and sustainability in mind. After all, one of the most important things in life is connecting with friends and family—and we build the roads that lead you there.